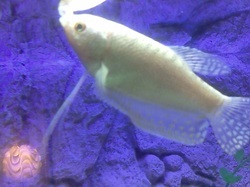 Gouramis are a labyrinths fish. This means they can breathe from the surface of the water through the use of lungs just like Bettas. Try not to keep too many grouramis in an aquarium because they do have territorial tenancies and will chase each other as will as other brightly coloured fish. If you do with to keep more then the aquarium should be wide enough so that they can claim their own little "territories". Food: Flakes, pellets, live, frozen, freeze-dried, peas & lettuce. Higher water temperatures and live food can promote spawning. The male will build a bubble nest out of floating aquatic plants and the spawning will take place below the nest. The eggs will float up into the nest which will then be guarded aggressively by the male. He will even chase the female away. After a few days the eggs will hatch and become free swimming. After that the male will become less aggressive and not guard the fry as much.